Clowns for kids parties. 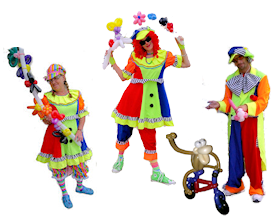 MD Children Entertainment provides clowns to hire in Toronto, Vaughan, Newmarket, Markham and more areas in Ontario. Our clowns are available to hire for kids parties, corporate events, festivals, birthdays, grand openings, school fun fairs, halloween events, christmas parties and more. Do you wanna have fun entertainment with professional clowns for kids parties? MD Children Entertainment has been providing clowns for kids parties since 2001 and we love to clown around.
" Hi Tanya, Just wanted to let you know that I was very pleased with Miss Day-Zee the clown, she did a great job and the children really enjoyed it. She was very talented and her artwork was terrific. Just wanted to say Thanks for coming to my daughter's party! She couldn't stop talking about the entertainment for several days! Also, I heard some really good feedback from the parents of our little guests! If I need your services again in the future, I will certainly keep you in mind!